At CES this week, Hewlett-Packard hardware got my attention. Though the company has been savaged in the media because of dubious acquisition decisions and a falling stock price, its brief exhibition of new Windows 8 laptops and hybrids at CES was impressive. 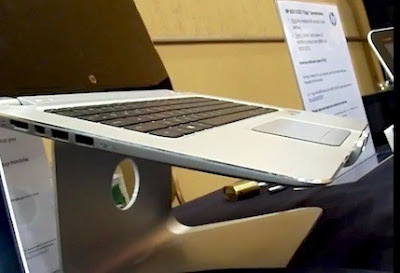 I'll focus on two, the EliteBook Revolve and Spectre XT TouchSmart ultrabook-- both touch-capable Windows 8 laptops. The systems were fleetingly exhibited at CES by HP during an event at the MGM Grand event on Monday night. I'll start with the Spectre XT TouchSmart because it was also at Intel's CES booth all week -- and available for any attendee to use. For me, it was my go-to laptop when I needed to escape the 11.6-inch screen constraints of my MacBook Air. HP calls it an ultrabook, but by ultrabook standards it's palatial, sporting a large 15.6-inch 1,920x1,080 resolution display. Other salient specs include an Intel Core i7-3517U 1.9GHz processor, 8GB DDR3 1600 MHz memory, and a 500 GB HDD with a 32GB solid-state drive cache. The display is gorgeous -- and made it really hard for me to go back to the Air's cramped 1,366x768 display. The Spectre XT's 1,920x1080 resolution is perfect for a 15-inch class display running Window 8. Windows 8 fonts look smooth, well-resolved but not so small that you can't see them. And speaking of Windows 8. I've tried my share of Windows 8 touch-screen laptops and this is hands-down the best experience I've had: fluid, fast, fun. No lag here. And one final thought: though it weighs just under five pounds, I found the weight distribution excellent. That is, it feels lighter than a traditional, thick 5-pound laptop. I spent considerably less time with the EliteBook Revolve but walked away feeling it had a lot potential (it won't ship until March). In fact, if I was to design a Windows 8 road-warrior laptop, it would be pretty much what HP has delivered. The Revolve is a convertible. That is, it has a touch display that rotates but doesn't detach from the base. But what I like about it is the practicality: it's only a little heavier than my Air but has a touch display and the option for built-in 4G. I can't overstate the importance of integrated 4G. With my Air, it's more-often-than-not a hassle to connect to my Verizon Mi-Fi or my iPhone 5's hotspot. I'm not going to go into all of the reasons why it's a hassle here but suffice to say it would be nice to have 4G built into the MBA. If Apple can provide an iPad 4 with 4G, why not an 11.6-inch MacBook Air? But getting back to the Revolve. The other big draw for me is the option for an HP docking station, allowing you to pop the laptop into a dock and instantly connect to all the ports of a typical desktop PC. If HP can deliver consistent quality on these two laptops, I would say there's still plenty of hope for the world's largest PC company.